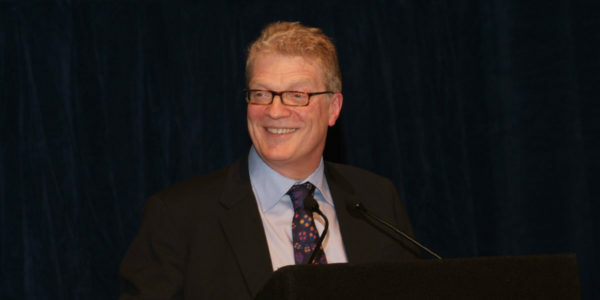 Institutions need to adapt quickly to the seismic changes in higher education to ensure that students experience the kind of education that leads to the fulfillment of their individual talents and interests, and stands up to the economic demands of the 21st century, says author and educator Sir Ken Robinson, a keynote speaker at the NACUBO 2016 Annual Meeting. A 2006 TED Talk, “Do Schools Kill Creativity?” has been viewed about 37 million times in 150 countries, making it one of the most-watched TED talks. 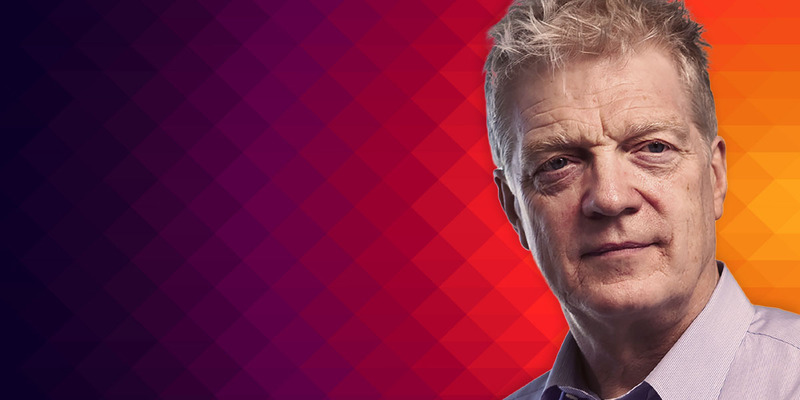 In it, Sir Ken Robinson, a writer, researcher, adviser, and speaker, proposes a straightforward line of reasoning: Children are naturally creative and schools must develop their capacities systematically for them to reach their full potential, but our formal systems of education don’t achieve this because of the way they are structured. 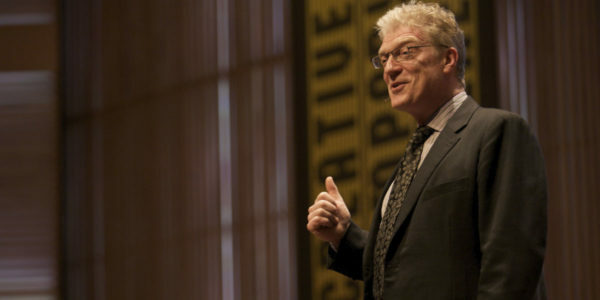 Robinson, who has been involved in many projects and initiatives around the world—with national and local education systems and with corporate, cultural, and community organizations—believes the talk is still immensely popular across the globe because the topic resonates strongly and fundamentally with people at all levels of education. Students, parents, and teachers recognize that education is becoming too impersonal and too standardized. The economic and cultural challenges that societies face, the world over, call for a different, more responsive, and innovative approach to education. In this interview with Business Officer, Robinson, who is a general session speaker at the NACUBO 2016 Annual Meeting in Montréal, July 16–19, discusses (1) the basic roles of education; (2) the impact of standardization on K–12 education; and (3) the roles of higher education institutions to ensure that students receive the kind of education they need to fulfill their natural talents and interests, and to meet the unprecedented challenges of the 21st century. It seems from your recent book, Creative Schools, that you wanted your audience to include parents and teachers, in particular, when you talk about creativity being essential for the success of young people and the vitality of communities. How can higher education institutions get involved in this cause and cultivate creativity in undergraduate and graduate students? There are seismic changes affecting higher education. One change is that the old assumption—that a university degree guarantees a good professional job—has been breaking down for a while. It used to be taken for granted that graduates would earn more in their lifetimes than those who don’t have degrees. Although on average they still do, it’s not to be taken for granted anymore. People are recognizing that there are other, cheaper ways of getting degrees—including myriad online providers—than spending four or five years at a traditional university. At the same time, knowledge and information are expanding exponentially and institutions can be slow to respond to these and other cultural changes. One of the big problems for the system, as a whole, which is directly tied to the interests of universities, is the pressureon K–12 education to standardize and raise test scores so that more students get the right results for university entrance. This pressure is a major obstacle to other essential reforms in K–12 education. Teachers tell me all the time that they’re under intense pressure to improve test scores to get students into good colleges and universities. We need real innovation in how universities select suitable students, which goes beyond this rigid reliance on test scores. There are various colleges and universities across the U.S. that are working on such alternatives. More people understand now the importance of cultivating creative thinking in education. But students enter a university having spent years in high school being asked to conform and come up with the right answers. Universities accept them because they’ve proven themselves to be good at test scores and compliance. Expecting students to become creative thinkers as soon as they get to the university is a bit of a stretch. Even so, we can help students think in more creative ways. One way is through more interdisciplinary work that exposes them to different ways of thinking. There’s a lot to be gained by faculty, too. There’s a huge dividend from specialists in different disciplines learning to work collaboratively, and to see things from the perspective of other people’s fields of study. A second way of encouraging more independent, creative thinking is through innovative pedagogy. Within universities, there’s a persistent tension between teaching and research. The quality of teaching often suffers because there’s more pressure on faculty to research and publish than to improve their teaching. More university teachers are experimenting with the so-called flipped classrooms and with more interactive forms of teaching and learning that encourage students to explore ideas and work collaboratively. They’re challenging students with questions and practical projects, rather than just getting them to take notes and repeat received information and ideas. If colleges and universities are serious about engaging students’ curiosity and creativity, they need deliberate strategies, not just optimistic expectations. Just as we can teach people to read and write, there’s a suite of creative thinking skills that students can learn and practice. College graduates do have a big advantage over nongraduates, at least, in finding employment and getting jobs that pay well. We present that fact often to policymakers and encourage them to support higher education and degree attainment. Yet, we really haven’t been able to increase very significantly the percentage of our population that has earned a college degree. Why do you think that is? One reason is a growing resistance to take on the expense of a college program without knowing if it will pay off financially at the end. Having a university degree typically does increase lifetime earnings, but unsettlingly large numbers of graduates don’t find work in their specialist areas and have to take jobs for which they’re overqualified or where their degree is irrelevant. Some employers are saying that they’re not interested in whether their employees have a college degree. They’re more concerned about their personal qualities and whether they can fit in with the company’s mission and culture. If they do, they’ll get the training they need on the job. Student debt is a big disincentive, too. Sometimes the quality of the university experience is also questionable in itself. In some universities, students have limited access to the scholars and professors who attracted them there in the first place. Students are taught in large, anonymous groups by teaching assistants who are desperately trying to make ends meet themselves. The relentless pressure of testing and standardization has also taken a toll on many high school students’ enthusiasm for learning. Often they’re just glad to get out of education altogether. If their experience in high school is a morbid repetition of test taking, it’s not hard to imagine why they’d have little appetite for higher education. One of the great strengths of the American university system is that the freshman year is an opportunity for students to take different courses and find out what piques their interest. The downside is that even after four or five years students can end up feeling lost and unsure about what they want to do. They may meet the university’s requirements for graduation, but not know what they want to do next. You’ve identified what you call four basic purposes of education: economic, cultural, social, and personal. That’s exactly what the curriculum at liberal arts institutions lends itself to. Some critics think we need to focus on the STEM fields. What are your thoughts? People naturally have different views on what education is for. In my view, it is to help people of all ages to understand the world around them and the world within them so that they can become confident, productive, and fulfilled citizens and individuals. Those four purposes—economic, cultural, personal, and social—are inherent in this conception of education and they all suggest the necessity of the liberal arts. Studying the liberal arts engages students in deep questions of ethics, values, and purposes. It illuminates the history and evolution of human culture and achievement. It raises critical questions about the nature of democracy and tyranny, and the tensions between freedom and social cohesion. Some understanding of all of these is essential in all walks of life, including business and politics. And by the way, the arts and humanities in themselves are also significant fields of employment for many people whose real talents and interest lie in these areas. The STEM disciplines are attracting a lot of political interest. They’re extremely important from an economic and cultural perspective. Some people find their talents and interests in these fields and it’s essential to provide properly for them. The STEM disciplines are also essential in education, but they’re not sufficient. To meet the four purposes I mentioned, education has to give equal weight to the arts and humanities, too. NACUBO works a lot with the federal government on higher education public policy. A large role of the federal government has been to impose systems of accountability, standard setting, and testing for higher education, as well as for the K–12 system. What do you think the role for the government should be with regard to higher education? [Whether it’s] state or federal, government does have key roles in higher education. One is as a conduit for public resources. Another is to help set priorities for how the resources are used. A third is to put in place proper systems of accountability, so that providers can show what they’re achieving and that they’re using the resources responsibly. The problems arise in how the priorities are set and by whom, and how narrow they often end up being. Also, in a classic case of the tail wagging the dog, systems of accountability often end up distorting rather than supporting the quality of education. One of the many problems with the legislation under No Child Left Behind was that it held educators accountable through a multitude of standardized high-stakes tests. This method of accountability became the problem it was supposed to solve. By delegating testing to the marketplace, the government generated a multibillion-dollar industry, which has done little to raise standards in schools and has wrought all kinds of damage on the system in the process. I was teaching at Warwick University in the UK at the beginning of the whole movement toward more accountability for university academics. One of the early problems was that the process was largely numbers driven. How many books have you published? How much money did you raise? How many papers have you published? These are interesting data, but the numbers don’t capture the quality or impact of the work on students and teachers, or on the university, as a whole. Part of the problem is a tendency for politicians to think that running a university system is no different from running an energy company or a retail chain—the main task is to balance the books and eliminate surplus effort. K–12 and higher education are human systems and they depend on the motivation and passions of the people in them to flourish. If you ignore those dynamics in favor of the balance sheet, you miss how education works and how to improve it. It’s why a lot of education systems are becoming more narrow and utilitarian. Some politicians evidently struggle to see the point of the liberal arts; collaboration; and creativity; and of any courses that don’t have obvious, direct economic utility. We need to keep engaging politicians in conversations about the larger purposes of higher education, the negative impact of testing in schools, and how issues of quality and diversity are fundamental, alongside those of cost efficiency. At the state level, funding for higher education, traditionally, was based upon on the number of enrolled students. Some states are now moving in the direction of full or partial funding, based upon outcomes, such as degree completion, on-time graduation, and so on. What is your view on whether that could be an effective positive practice, or perhaps the opposite—one with the potential to discourage schools from enrolling kids who are going to be more challenged by a higher education experience? It’s important to have good data to inform how public money should be spent on education. But higher education, like K–12, shouldn’t be seen as a short-term expense but as a long-term investment. The returns shouldn’t be defined in narrow economic terms, for example, by how many students graduate and immediately find well-paid jobs. Graduate supply and demand isn’t like an oil pipeline, with a flow that can be opened or shut down as immediate demand changes. In my book, Creative Schools: The Grassroots Revolution That’s Transforming Education, I argue that education is an investment in the public good —economically, socially, culturally, and personally—and it’s essential to recognize how it contributes not just to the bottom line of our economies, but to the overall health and vitality of our communities. The risk in quantitative measures is that priorities are focused on areas that seem to have the most immediate payback. These approaches are usually at the expense of the broader missions of the universities, and they can restrict opportunities for less conventional students to get into the system in the first place. Effective leadership is a key ingredient to initiate changes that are necessary in higher education. The kind of change that you suggest requires leadership, which can work in and potentially transform a culture that highly resists change. What are your thoughts on the qualities of leadership that can be effective in higher education? The challenge is twofold. How do you run an organization that is flexible enough to respond to the profound technological, demographic, and cultural changes that are swirling all around us now? And how do you run it in ways that take account of the exponential developments in knowledge and understanding in so many new and emerging disciplines? It’s a compelling challenge for leaders. Institutions aren’t bricks and mortar; they’re the people who occupy them. For organizations to change and adapt, there have to be flexible working structures. If organizations are run on the principle of command and control for efficiency, they’re less likely to have the internal flexibility and dynamism they need to cope with the changes they have to contend with. Institutions that cultivate internal innovation in structures and systems are much more likely to evolve and adapt to change. The role of a creative leader is to encourage innovation and fresh thinking, not to discourage or penalize it. It’s to enable people to think differently and act differently within the agreed purposes and mission of the institution. The crucial point is that the role of a creative leader isn’t to have all the good ideas; it’s to create a culture where everybody has ideas and feels that they’ll be taken seriously and given a fair hearing. That means a more collaborative and open style of leadership. And, it’s needed now more than ever. JOHN D. WALDA is president and CEO of NACUBO. If colleges and universities are serious about engaging students’ curiosity and creativity, they need deliberate strategies, not just optimistic expectations. There’s a suite of creative thinking skills that students can learn and practice. Higher education, like K–12, shouldn’t be seen as a short-term expense but as a long-term investment. The returns shouldn’t be defined in narrow economic terms, for example, by how many students graduate and immediately find well-paid jobs.